The second Sunday Swing is now on the foot. One pattern repeat finished; 3 more to go and then the toe decreases. 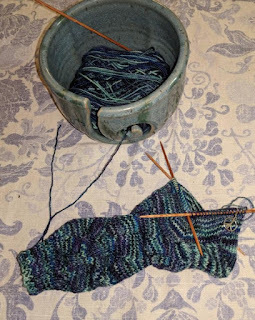 I had thought I would work on some other items as well - stitching, Fletcher's cowl, Hitchhiker...but instead I took care of some chores (cleaning, laundry and pulling the tax stuff all together). I also managed to take a 2 hour nap!! I think I made up for those nights of insomnia I had recently. I also enjoyed not being on the computer...and will attempt to catch up on some blog reading today. I have a few financial reports to run and send out, but other than that, my day is pretty open (and Hitchhiker came to work with me for lunchtime knitting). The sun is out, the snow and ice are melting and Fletch is grilling tonight! I think it's going to be a great day and I hope yours is as well. I think a grilled meal sounds terrific. Our snow melted away, too, so I am stealing your idea and installing Rick at the grill for steaks tonight. The weather is so goofy, who knows when the next chance will be? You will be done those socks in NO time!! They are looking great. Ten hours + a nap!! Catching up, indeed. I have a night owl that creeps up on me once in a while, so I have sleeps like that, too, on occasion! Glad you didn't have to travel in the snow/ice mess. A snow day to sleep in, get some things done, plus a nap sounds perfect! Add sunshine and Fletch grilling for dinner tonight and it is a great day! We got a bit of freezing rain over night, but that was it. Its warming up again now. Relic is tracking mud all over my house ...again! Your sock is looking great! I really like that yarn! Happy to hear you were able to sleep and wake w/o an alarm. Your body obviously needed rest. Have a wonderful day. How fun! A snow day! I’m glad you were able to get some things done and your sock is coming right along. We’re supposed to get a dumping of snow again tomorrow. This is the winter thats never ending, however the sun is shining today so I’m going to enjoy it while I can. We got our taxes back from the accountant this week. Quite a disappointment but I’m hearing that from everyone. now that kind of snow day is maybe the only thing I miss about living in snow country - best wishes for tomorrow!! The weather was so weird today. We had snow on the ground but it was sunny and warm. Crazy. My poor bulbs don't know what to do. what a great catch-up on sleep for you! And on your sock! Yay! I so envy people who can enjoy snow days without having to make up every single minute at work! Our school days will be 7-minutes longer starting on Monday, which I am not happy about. As it is, teacher are only paid for 10 minutes before 1st hour and 19 minutes after classes end. I'm hoping for no more snow days this year! Sounded like a fun mid-week snow day! We spent ours inside just chilling out too. School was cancelled so it was great to spend the day with the kid & watching movies. Love how your socks are looking!